Our first day on our Italian getaway was highlighted by a late plane landing and a race through the airport to catch our train to Florence. We got into our seats with about 8 minutes to spare, which completely blew our minds because we thought the trek through customs and the wait for baggage alone was going to take forever! Pleasantly surprised, we napped on the ride through the rolling hills of Tuscany, under cloudless blue skies, and were happy to get to Santa Maria Novella station in Florence. From there we walked to the Airbnb apartment we rented, just a five minute walk to the Arno River, snaking its way though the historic district of the city, and about 10 minutes from Ponte Vecchio, the famed covered bridge leading to Piazza Della Signoria and Palazzo Vecchio. 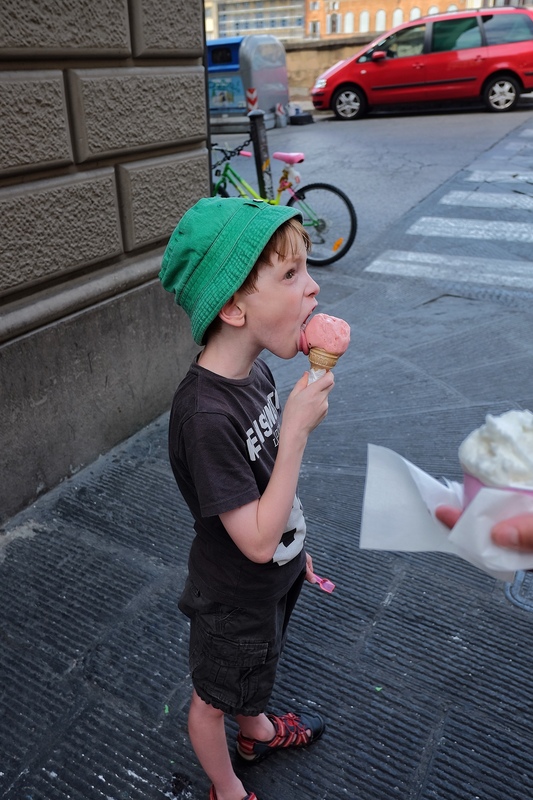 Not even an hour in Florence and Rowan is enjoying his first gelato. We walk our way past these amazing landmarks two or more times a day and never get tired of the view. It’s unbelievable that these Renaissance buildings with their towers and crenellations, ochre walls and shuttered windows, look exactly as they did 500 to 600 years ago and are still in use today. How amazing would it be to live here and walk past these gorgeous buildings every day?!? On our first full day here, we got up late and walked to the Pitti Palace. We toured the main exhibits in the museum for about two hours, which was beautiful, calm, and, unlike the 37 degrees outside, quite cool. Rowan’s favourite room was the red throne room; mine were the rooms with paintings by Cristiano Banti, Giuseppe Abbati, Giovanni Fattori, and modern artist Elizabeth Chaplin; Kevin’s favourite was the Green Room, because it had a Caravaggio painting, though it was out on loan! Ahh, even a close encounter with a Caravaggio is enough to make Kevin’s heart beat a little faster! 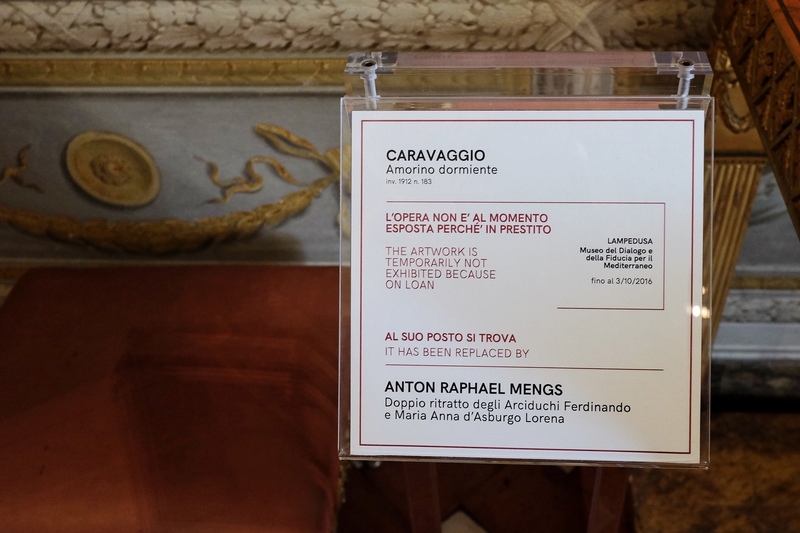 Not just one Caravaggio off exhibit — three! 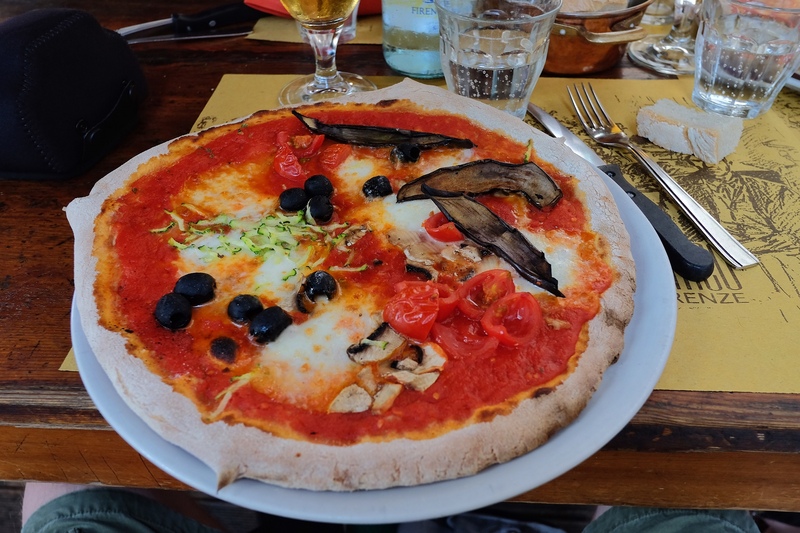 In the afternoon, we went to see the main basilica, Santa Maria del Fiore, enjoyed a beautiful lunch nearby, and then a walk to the Medici Chapel in the basilica of San Lorenzo. Rowan liked it because we let him choose our path through the museum and chapel, ending up in front of the Michelangelo sculptures. While Kevin took pictures, Rowan and I sat on a bench and talked about the sculptures, the ceiling and what we liked best on our first few days in Florence. Michelangelo impresses more than just tourists. Highlights: the Pitti. Lowlights: all the walking in the heat. Our first of many pizzas. I completely understand, my little man. But even with the scorching summer weather, Florence rocks. Our 7-year-old tour guide was the best! Brings back memories, wish we were there.